Outdoor cushions can easily make the garden or terrace a more livable space, not only during cool summer nights, when we feel warmer and more pleasant while seating on a soft pillow. The more comfortable the seating is the more likely you are to use your garden or terrace frequently and maximize your enjoyment of the space treating it as an outdoor living room. Outdoor cushions from HASTE GARDEN collection are made according to the highest quality standards and are manufactured of materials specifically designed for outdoor use to reduce the maintenance required. The filling is high durability foam (freon free) and silicon and the covers are produced of acrylic fabric made of 100% dry- spun and fibre-dyed DRALON® with TEFLON® stain-proof and water repellent finishing. Fashionable brilliant colours, strength and durability, and a comfortable feel are the hallmarks of the fabric. Due to the fibre-dye, the colour stuff penetrates in the heart of the fibre and the dye is distributed in a homogeneous way throughout the yarn. This enables a high degree of colour resistance and good light and UV fastness. 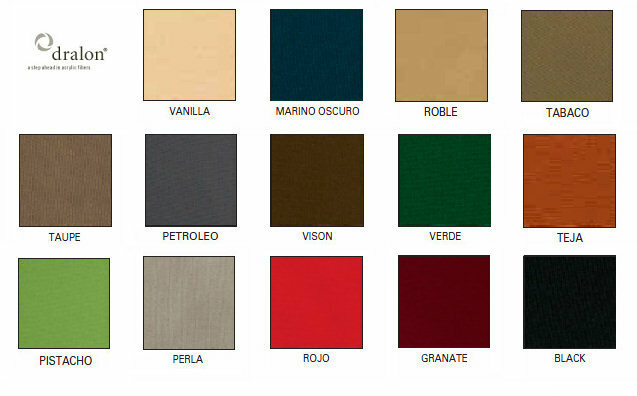 HASTE GARDEN cushions are available in a wide range of 14 elegant plain colours that add to the ambience of the patio and complement outdoor scenery.